Sometimes it is as much an art as a science. I designed this area to be used as a disaster recovery and training room. It can handle 21 PCs. Each PC has an internal and external network port. Each PC has its own power outlet and there is a projector and screen available. Just behind the back wall there is a dedicated switch rack with two 48 port switches. One switch is dedicated to the internal network and the other switch is dedicated to the external network. Each switch has a fiber trunk back to the core switches. Working in this area is pretty easy. Each PC is numbered and the ports on each switch correspond with the number on the PC. For example, PC10 has port 10 on each switch. The raceway on the floor is made by Hellermann Tyton. It was pretty easy to work with. It has a divider down the middle. I ran electrical on one side and data on the other. I definitely did not do this job by myself, but I am proud to have been a part of it. The data center had become unruly and unorganized as a result of very fast growth over a couple of years. 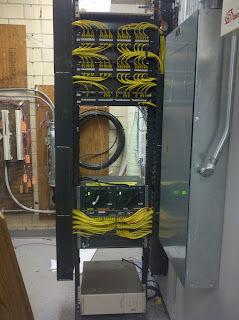 I designed a plan that allowed us to color code each rack, voice, utility (switched PDU and KVM), and wireless uplinks. I had an electrician install two separate circuits for each switched PDU. This allowed every switched PDU to have two redundant circuits. All of the circuits were hanging off of a Leibert UPS as well. When you plug each of the dual power supplies from the servers into separate switched PDU units you have effectively given the server access to four electrical circuits. How's that for redundancy? The ladder rack was installed so our data and power cables could come out the top and our more delicate fiber patch cables could go under the raised floor. 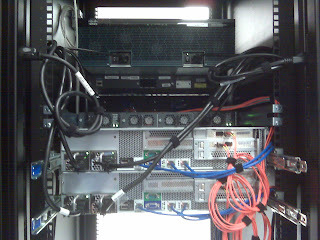 Each server has teamed network cards and they each go into a separate core switch. Each switch port has a port description assigned to it so troubleshooting is much easier. Any switch in this stack can go bad and all connectivity remains intact thanks to the redundant trunks. 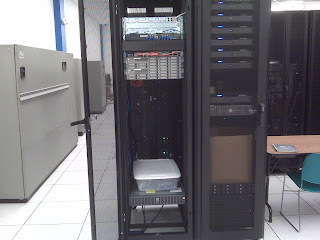 It took our team an entire weekend just to do the server racks and then another very late night to do the switch rack. When it was done it was much easier to work on and in my opinion it looks like something to be proud of. Seeing all your servers laid out was very SCARY! This is the final product of a new install I did for a customer. 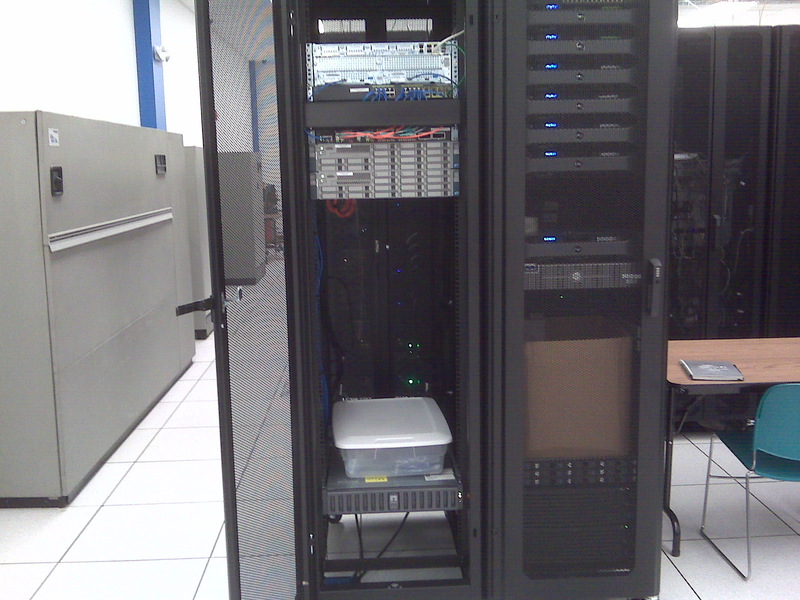 It consists of two Cisco UCS servers running VMWare with a NetApp fibre channel storage system. There is a Cisco MDS switch for the fibre channel, a Cisco data switch and a Cisco router as well. The router is a VPN router providing access for the customer as well as their clients. There are about twelve virtual servers running with a variety of operating systems. 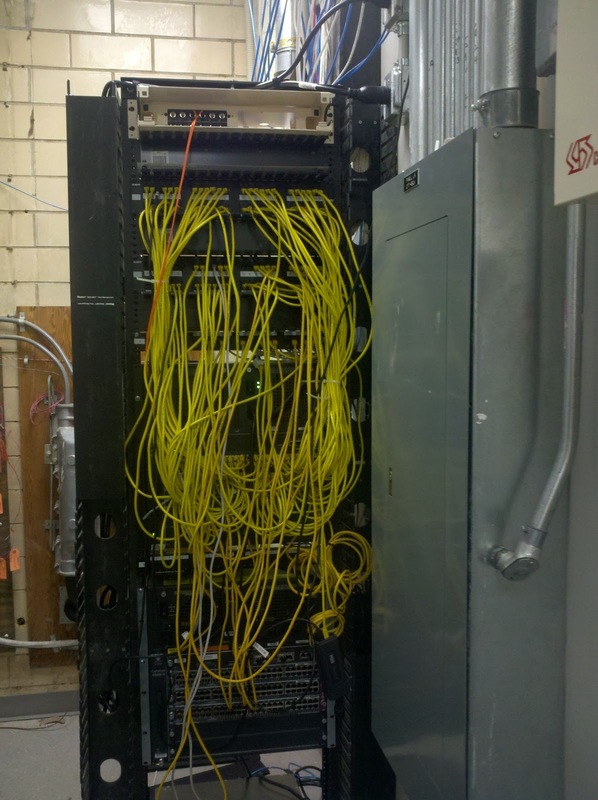 This was installed in a hosted data center. 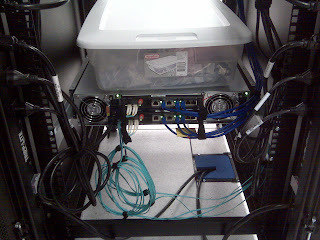 The plastic box in the rack is there holding the customer's extra supplies because the data center does not allow cardboard. One of the great things about this setup is the customer's entire technology investment is right there. They have developers and clients around the world accessing these systems. VMWare saved them a lot of start up capital and installing in a hosted data center provided very well equipped facilities to operate from. I did the one on the left. 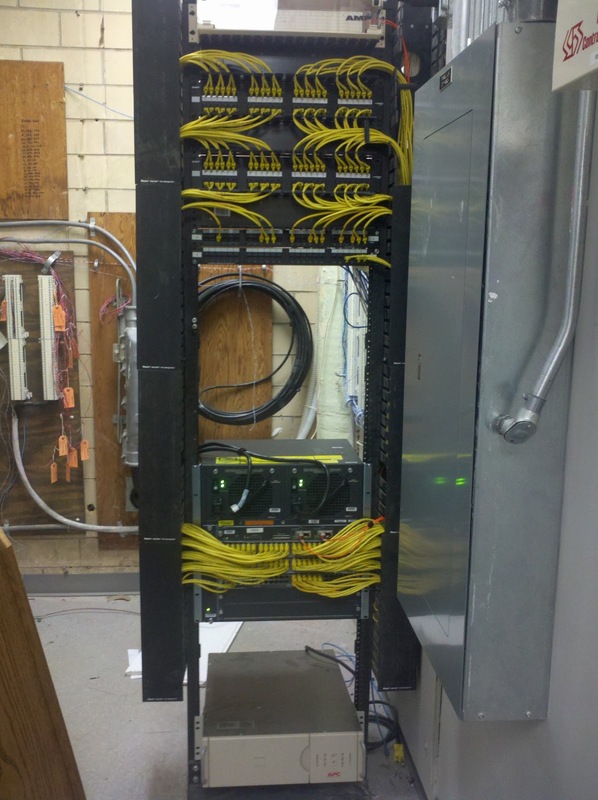 This project involved replacing an old 4006 switch with a new 4506 switch. The old switch was still running CatOS and the old supervisor blade could not be upgraded to IOS. The new switch allowed us to provide Gig to the desktop and PoE for our upcoming VoIP rollout. I decided to take all the old patch cables out and replace them with cables that are all the same color and the proper length. Working with a chassis style switch is a bit of a challenge when it comes to wire management. One thing I try to plan for is the eventual removal and replacement of a blade. If you do not keep your wires clear of neighboring blades you can end up in a position where the replacement of a failed blade may require the removal of patch cables in other blades. In the after picture I left some covers off so you can see the routing I chose to use. If anybody has found any interesting ways to manage the wiring on a chassis switch I would love to hear about it. Please feel free to post your ideas. It isn't too often that we get to install a network from scratch, but on this project I got to start over! 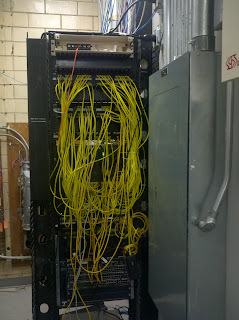 The existing network was a rats nest and nothing was labeled. I needed to prepare for a VoIP rollout and we all know that a good network is necessary for a successful voice project. Here's a picture of my MDF closet. It is complete with redundant core switches running HSRP and EIGRP. I have a backup VPN router in case my primary MetroE goes down and thanks to EIGRP it is all dynamic! Every port provides Gig PoE so wireless access points and phones will be no problem! The patch cables are color coded and there are six other IDF closets uplinked to this MDF via 10G fiber. Saweeet data center reorganization and clean-up!